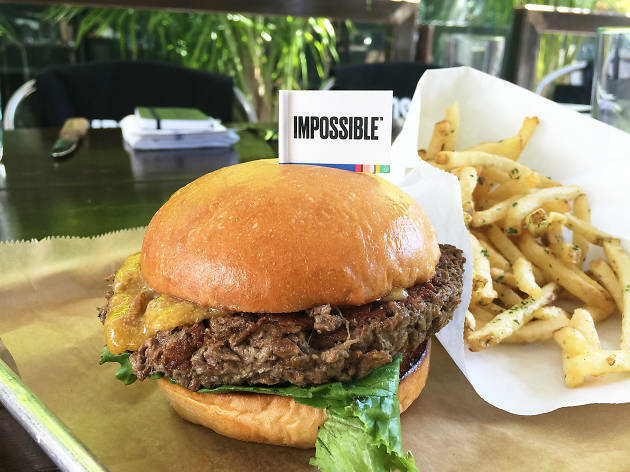 It was bound to happen at some point—the Impossible Burger, a genetically modified burger from Impossible Foods Inc. that has been making the rounds at restaurants across the country, has finally landed in Austin. It showed up briefly during SXSW this past year, but starting tomorrow, June 23, you'll be able to get the meatless (but bleeding!) burger at Hopdoddy Burger Bar locations across Austin, including its flagship Congress Ave location. If you're wondering what the hell an Impossible Burger is, here's a primer: developed by Impossible Foods Inc., the burger is made entirely from plants and is produced without antibiotics, hormones, cholesterol or artificial flavor. So what makes it different than any other veggie burger? This one actually bleeds—sort of. The burger uses an all-natural ingredient called heme that contributes to the bleed characteristic of meat. Essentially, it feels like you're taking a bite out of a real hunk of meat, juicy drippings and all. 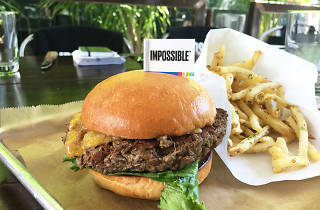 At the media preview on Thursday, Pat Brown—founder and CEO of Impossible Foods—said that hamburger-obsessed Texas was the next obvious location—and as a result of partnering with Hopdoddy, more than 40 percent of restaurants that serve the burger will be in our state. The Impossible Burger first launched in 2016 at Momofuku Nishi in NYC, and has since been offered at restaurants across New York, California and Nevada. It'll now be available at 11 Hopdoddy locations in Austin, Houston, Dallas-Fort Worth and San Antonio. After a brief run-through on the burger, I watched the Hopdoddy staff working the grill, where the patties really did look—and sizzle—like real meat. Dressed with a simple trio of lettuce, tomato and onion, the burgers were passed out with fries and ketchup and the hopes that this would somehow convert veggie burger-skeptics into believers. The verdict? It was really, really good. Juicier than your standard veggie patty and far lighter than an all-beef one, the Impossible Burger satisfies the craving for meat while avoiding that uncomfortable, overstuffed feeling at the end. Sure, it didn't taste exactly like meat, but it was pretty damn close—and for those wanting to cut down on their carbon footprint, it's a viable option that won't have you crying over a bland bean burger. The Impossible Burger will be available at all Austin Hopdoddy locations starting on June 23. Let us know what you think of it!